Seeing San Francisco through fresh eyes never fails to remind me of how pretty this city is, and how unbelievably lucky I feel to live here in the San Francisco Bay Area. Our one day stay at the Palace Hotel, San Francisco..... It is a very elegant hotel. The beautiful stained glass dome ceiling at the Garden Court Dining was simply stunning! Too bad that our camera just couldn't capture the entire area. Since Choon Ping is a 'Platinum Member', we got upgraded to a suite and with our choice of either having a free gift, hotel free points, or complimentary breakfast. Now that we've a little man... of course complimentary breakfast is the way to go! The hotel lobby was so busy and packed with lots of guests waiting to be checked in. We got there at around 1pm, hoping that we could get an early check-in and put Wy to bed. But we were still waiting for our room at around 3pm. :( The hotel is surprisingly reasonable in price. The service at the hotel was just ok. But I think it's the holiday season... it's understaffed. 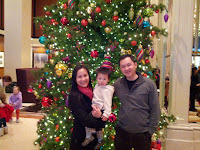 The Garden Court Dining with a huge Christmas tree at the center. 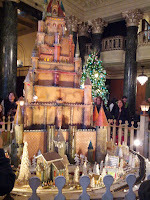 The gingerbread structures display at the hotel lobby was quite amazing! 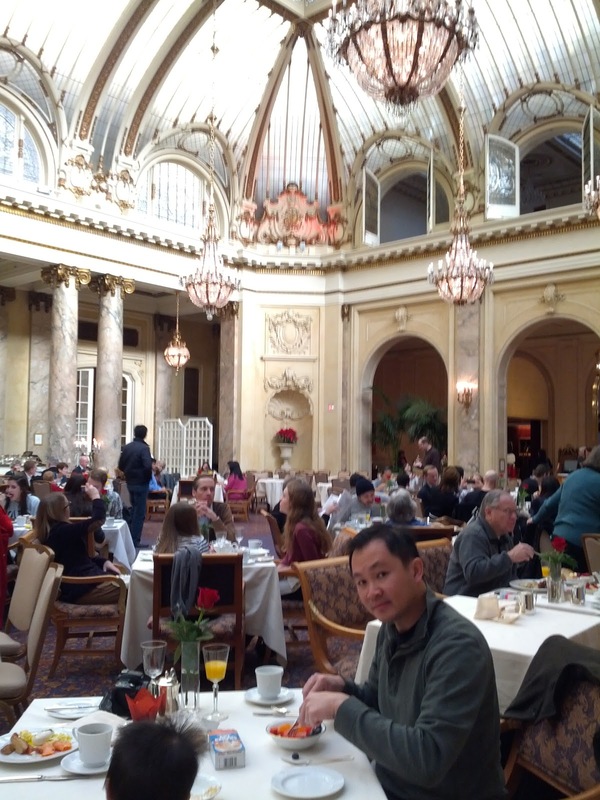 LOVE having breakfast at the Garden Court dining area. The atmosphere... ahhh!! 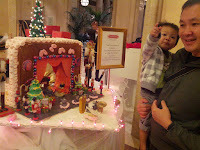 Saw lots of families with kids coming here to enjoy their long weekend and celebrating their Christmas family gathering. 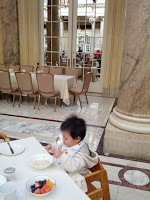 Wy enjoyed the breakfast very much and was very well behaved. :D The mothers at the other tables were quite impressed that he could sit on the baby chair the entire time. Maybe it's the food plus the nice atmosphere. :P But then, he's always pretty good when having breakfast. Lunch and dinner time are a bit more challenging for him to stay on the chair the entire time or maybe... doesn't want to sit or eat at all! Anyway he ate a lot for his breakfast; a bottle of milk, a bowl of cereal, bowl of fruits, entire piece of French toast, and snacking on our bacon! The Christmas tree at Westin St. Francis is not as nice as the one at Palace Hotel. The sugar castle at Westin St. Francis and the Christmas tree at Union Square. Wy loves looking at buses, trucks and cars. Anyhow, it was a great short get away from home. We had a fabulous time! Happy Holidays! !